Our therapists travel to you to provide sessions in your home. We bring all equipment and instruments needed such as keyboards, guitars, drums, and shakers. 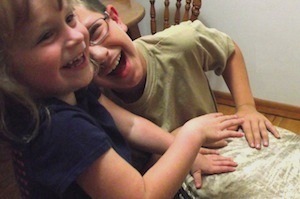 Home-based assessments offer an evaluation of an individual's strengths, needs, and responses to music. After 3 sessions, a written report is provided which will focus on areas of need in which music therapy can provide assistance. Therapy can focus on a wide range of areas by using singing and song writing, music improvisation, instrument playing, and movement to music. Miami Valley Music Therapy has provided home based therapy for individuals with many different needs such as Down Syndrome, Williams Syndrome, cerebral palsy, autism spectrum disorders, and with individuals recovering from stroke and traumatic brain injury. We will also work with you to identify possible sources of funding such as through the Autism Scholarship, County Board of Developmental Disabilities, Post Adoption Special Services Subsidy, Down Syndrome Association Scholarships, and other area grants and funds.